10 – Retrace your steps. As soon as you realize that you have lost something think back to the last time that you had it. This will allow you to retrace your steps so that you have your search area for you to go back and look for the item, which you should definitely do immediately. 9 – If it is the same day, revisit the location. As you are retracing your steps, check the route that you took and all around the area that you last had it. Ask the cast members in your search area if they have seen it or if anyone turned the item in. This can help you locate your item much faster and hopefully receive instant comfort if you learn that someone located it and turned it in. 8 – Be sure to check the main Guest Relations for the area. All items that are turned into cast members, regardless of the location in the park, are sent to the Guest Relations at the front of the park (this is also true for Disney Springs). Rounds are usually made every 2 hours to collect items from every location so that they can be transported to the front. If you did learn your item was turned in, it may have a little bit of a journey to get there, but you’ll definitely want to ask to see if it has been turned in, and even ask again at the end of the night. 7 – Fill out an online form. Disney World now uses an online system to try to locate lost items. If you lost an item in a theme park, Disney Springs, ESPN Wide World of Sports, a Disney water park, Disney resort, or Disney transportation (buses, monorail, and watercraft), follow this link to report a lost item. You’ll receive an email notification once you’ve submitted the form. Allow up to 48 hours for Disney to try and locate the item and send another email update. 6 – What to do if you lost something on the Magical Express. 5 – What to do if you lost something on Disney transportation. If you leave something on a resort bus, monorail or boat, then the items are returned to Guest Relations or the Lobby Concierge for the area that they are servicing. So depending on what transportation you are on, you will want to check at the most appropriate location. If you lost something on transportation and are unsure where it would be returned you can always ask for assistance. They will help point you in the right direction. Otherwise, they will direct you to fill out the online lost item report. 4 – Did you leave or lose something in your resort room? This can happen from time to time. Maybe you forgot a shirt or pair of shoes at the resort, or maybe you notice a stuffed animal or piece of clothing is missing from the room and may have accidentally gone out with the change of linens with housekeeping. If you are still at the resort, speak with the front desk about the item. They can help get in contact with housekeeping to help get the item found and returned to you. If you have already left, then call the resort. Describe the item and what room you were in. They will make best efforts to find it. Don’t hesitate to call multiple times to help give you peace of mind and get it tracked down. There are also times where you may have left something and not realize it. When housekeeping finds items after guests have checked out then turn them into the lobby and the lobby will usually either call you or send you a letter so that you can claim your item. 3 – Be sure to save all receipts for Disney purchases. We all love our Disney souvenirs and merchandise, right? Be sure to save ALL receipts for your souvenir purchases. This is especially helpful should you lose an item while in the parks or at your resort. Many times if you explain the situation and show the receipt, Disney will replace the item for you or at least work diligently with you to investigate and help provide a solution. There are no guarantees it will work out this way depending on the item, but it is always better to be equipped with a receipt for the item showing the time and date of your purchase than to try to go in with nothing. 2 – How long are items held? Items that are of a larger value like cameras, phones, etc. are held for 90 days. Items that are of a lesser value like sunglasses, shirts, etc. are held for 30 days. It is always best to act as soon as you realize you have lost something than to wait. 1 – Go to social media. As soon as you have realized that you have lost an item, then you retrace your steps and check Guest Relations. After that it never hurts, especially depending on the item, to go directly to Disney groups on social media to try to locate the item. I am in tons of groups with thousands and thousands of members where at any given time many of them are in the parks, plus many cast members. It may be a long shot, but if it is something of value or sentiment to you then it is definitely worth a couple posts with a picture of the item if you have one. You never know who might have seen something or what connections cast members may have to help you in your search. I wouldn’t bank on this, but I would definitely utilize it since you never know! Lots of items lost at Disney have been successfully returned from using social media to help find them. Bonus: Don’t forget to pay it forward. So we have talked about how to help get your own items back, but don’t forget to pay it forward to those that may have lost an item. If you see something fall from a bag, stroller or pocket, alert the guest so that they don’t have to go through the turmoil of looking for their item. If you find something be sure to stop and pick it up to turn it into a cast member. There are unfortunately people out there who trample over lost items or worse pocket them to keep them for themselves. Collect the item so that it is safe even if it is something small like a trading pin. You never know the story behind something even that small. Maybe it was a child’s absolute favorite pin, maybe their deceased grandmother had bought it for them on a future trip and it fell off their lanyard. Even the smallest things can matter a lot to someone else, so turn them into a nearby cast member and give them the details on exactly where you found it. 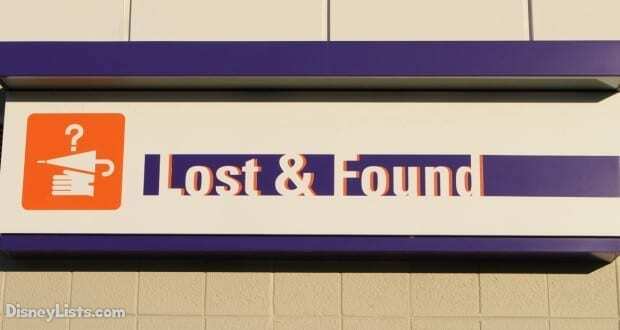 This can help in getting the item back to their owner. It doesn’t take much time your day to turn in items you find, but it can make a huge difference for another guest so pay it forward when you can.